Fertilizers are responsible for over half of global food production, but there are areas in world with nutrient deficiency and other areas of nutrient excess. Managing soil fertility requires careful application of science and skill to meet production, environmental, and social goals. Getting crops off to a good start is critical for achieving high yields. During this early stage of growth, seedlings are especially vulnerable to many environmental and biological stresses. Protecting plants from stress and disease begins with providing balanced nutrition from planting through harvest. Potassium plays an essential role in many well-recognized metabolic processes for plants. Potassium’s contribution to sustaining high yielding crops with top quality is well understood. However, the role of potassium in plant stress resistance is less known and appreciated. Potassium is unique among the essential mineral nutrients in its role for plant survival against environmental stress, pests, and diseases. Supplying adequate potassium to crops through proper fertilization is a simple way to lower the requirement for pest-control treatments that may be costly, time-consuming, and troublesome. 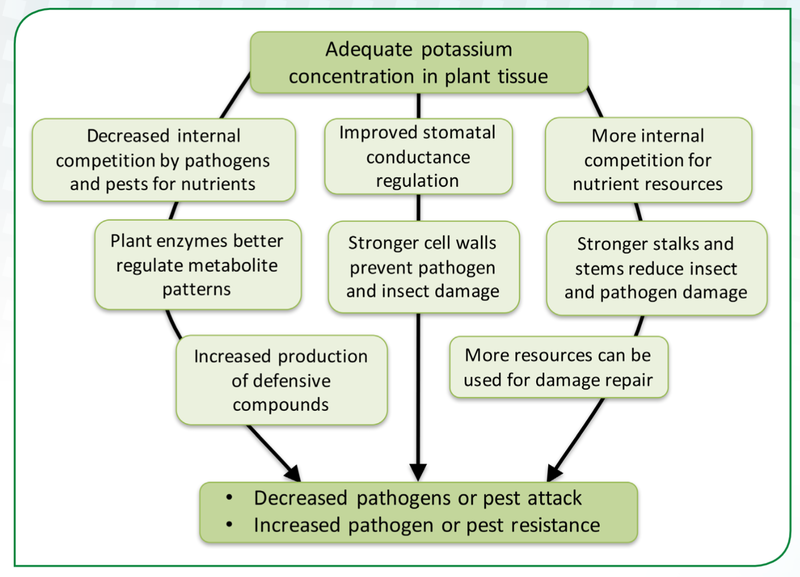 The frequently observed benefits of potassium on plant health were reviewed by Wang et al. (2013), which summarizes many recent scientific studies. How potassium protects plants; Wang, M. et al. 2013. When there is a lack of sufficient potassium in plants, low molecular weight compounds begin to accumulate. This build-up of soluble nitrogen-containing compounds (such as amino acids and asparagine) and sugars (such as sucrose) makes a particularly favorable environment for numerous pathogens and insects. For example, aphids are severely nitrogen limited, making potassium-stressed plants an attractive host as an abundant nitrogen source. The presence of sufficient potassium also promotes the production of defensive compounds (such as phenols) which are an important component in plant pest resistance. An adequate potassium concentration within the plant decreases the internal competition with various pests and pathogens for resources. This results in more resources available for hardening cell walls and tissues to better resist penetration of pathogens and insect pests, and to repair any damaged tissue. Air-borne pathogens are more rapidly shut out from stomatal invasion when adequate potassium is present. The link between adequate phosphorus and plant health is also well known, but perhaps less understood than the association with potassium. Phosphorus is involved in the synthesis of many organic molecules and complex metabolic functions within plants. Crop growth and yields will be significantly reduced when phosphorus is deficient in soil or when plant roots cannot access it. A shortage of phosphorus frequently leads to more disease for many crops. Some of the protective response occurs because healthy plants with sufficient phosphorus have vigorous root growth which allows them to outgrow and escape disease. More specifically, an adequate phosphorus supply has been linked with decreased incidence of Pythium root rot for wheat, leaf blight for rice, numerous tobacco diseases, blight in soybean, and many other diseases. Foliar application of phosphorus-containing sprays is reported to induce protection against powdery mildew. The important role of chloride as a nutrient is often overlooked, especially in regions where soil salinity is a concern. However in many areas, the addition of chloride results in increased plant vigor and disease resistance. The occurrence and severity of a number of plant diseases have been documented to be reduced following the application of chloride. This includes take-all, stripe rust, and Septoria in wheat, and stalk rot in corn. Promoting plant health clearly includes a solid foundation in proper nutrition. Strong and vigorous crops are able to produce abundant yields of high quality, while better resisting diseases and pests.